Only a bright orange fireball could be seen from the bridge of the USS Lake Erie – which is about five stories above the cruiser’s forward missile tubes. The Pearl Harbor-based cruiser fired two missiles, three seconds apart, but needed only the first one to kill a drone in mid-flight. ABOARD THE USS LAKE ERIE » The Pearl Harbor-based cruiser USS Lake Erie made its 10th kill today when it successfully intercepted a ballistic missile in the first sea-based missile defense test since the ship shot down an errant satellite earlier this year. The ballistic missile had been fired from the decommissioned helicopter carrier USS Tripoli about 250 miles northwest of Kauai. Lt. Cmdr. Drew Bates, Lake Erie’s officer of the deck, said he was able to see the two missiles collide and “I heard confirmation” from the combat information center that directed today’s operation. Immediately following the 8:19 a.m. intercept, Capt. Ron Boxall, skipper of the Lake Erie, went on the ship’s intercom with the message: “Well done shipmates,” noting that all the crew’s training paid off and the missile operation went off exactly as planned. Lt. Cmdr. Drew Bates, officer of the deck on the Pearl Harbor-base USS Lake Erie – used one of the monitors on the bridge of the ship to check on missile launchers located on the forward portion of the warship. The Lake Erie today successfully knocked down a drone missile fired from a floating mobike platform located 250 miles northwest of Kauai. 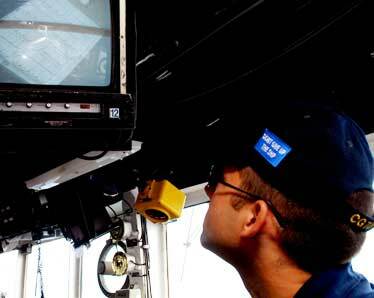 So far, the Navy and the Missile Defense Agency have scored 14 missile intercepts in 16 attempts since 2002. For the USS Lake Erie, it’s 10 out of 12. Today’s $40 million test is part of the military’s program to defend against short range SCUD-type missiles, like those used by Iraq against Israel in the 1991 Gulf War. The Tripoli, which was decommissioned in 1996, also was used as a mobile launch platform last year. In a test held in October, the interceptor missile was fired from a land-based launcher at the Pacific Missile Range Facility at Kauai’s Barking Sands. The Aegis cruiser USS Lake Erie has been the Navy’s test bed for its anti-ballistic missile program and today fired two missiles to intercept the drone missile in the earth’s atmosphere. It was the second time the Navy has tried to intercept a missile in its terminal stage, or the last few seconds before impact. Today, although two missiles were fired; only one was needed to knock out the drone missile. The second interceptor self-destructed. Petty Officer Lui Myers (in yellow jacket) directed the refueling of an SH-60B helicopter from Kaneohe Bay at twilight yesterday from the flight deck of the USS Lake Erie. 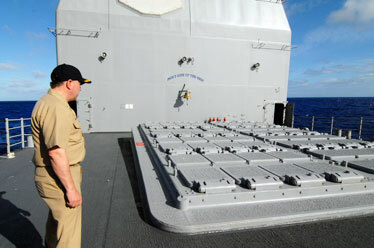 The vessel will participate today in a crucial missile intercept test near Kauai. 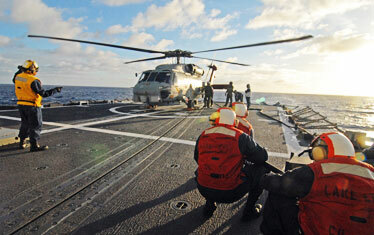 The helicopter was used to ferry parts needed for today's missile shoot. The Tripoli launched the target missile at 8:13 this morning and four minutes later the Lake Erie responded with two “birds” or interceptor missiles. The kill occurred two minutes later 12 miles above the Pacific Ocean. The Lake Erie’s last successful attempt was in November when the 567-foot cruiser knocked out two scud-type missiles launched from the Pacific Missile Range Facility at Barking Sands with two of its own missiles. 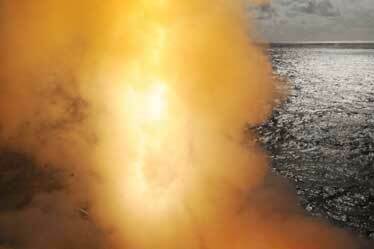 Today the two interceptor Standard Missile-2 Block IV missiles were fired less than three seconds apart. In February, the Lake Erie successfully shot down a U.S. spy satellite in the Aegis’ system’s first real-world mission. The Navy has three Aegis cruisers — Lake Erie, Shiloh and Port Royal — and six Aegis destroyers — Decatur, Curtis Wilbur, McCain, Steethem, Fitzgerald and Russell — in the Pacific Fleet that can intercept missiles. The Lake Erie, Port Royal and Russell are based at Pearl Harbor. 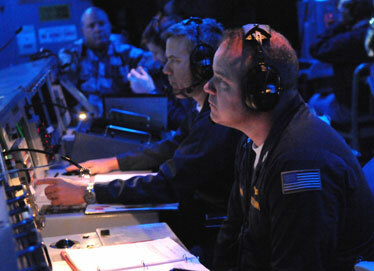 Above, Lt. Jeff Petersen, right, monitored the flight of a Scud-type missile along with Capt. Ron Boxall, skipper of the Pearl Harbor-based cruiser USS Lake Erie, during yesterday's final simulation exercise. Navy Capt. John Trombetta inspected the missile launch tubes yesterday. The tubes are located on the forward deck of the Lake Erie. Two interceptor missiles will be launched this morning, intending to destroy a drone missile in flight, 250 miles off Kauai.